Spring is in the air, Easter is around the corner and of course, we have eggs galore! 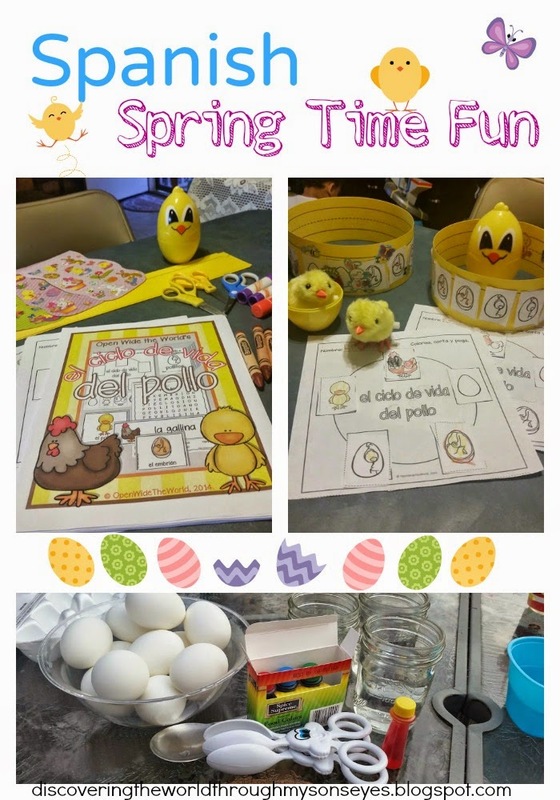 During little one’s Spanish playgroup we dyed some eggs, and we learned about the life cycle of a chicken. Disclosure: I received a complimentary copy for the purpose of reviewing it. I did not receive monetary compensation for this review. All opinions are my own. We began our Spanish lesson dying some eggs out in the yard. The afternoon was beautiful, and the weather just perfect! We then moved the lesson indoors, and used the packet “el ciclo de vida del pollo” by Open Wide the World. We are all big fans of Julie’s work! As I have expressed in the past with other packets by Open Wide the World these can be tailored, and used according to your children’s ages. The activities can be done in a group or on an individual basis. As a surprise for the kids I gave them a chick egg, with a wind-up chick inside. They were beyond excited!!! They were pumped up to learn about the life cycle of the chicken! 🙂 Since the Spanish playgroup kid’s ages ranges from ages 4 – 6 we do we did the life cycle cut and paste, and the headband activity. They truly enjoyed making the headband, and they decorated them with other fun Spring stickers. The packet includes the following: Life Cycle Concepts, Vocabulary Concepts, and some fun extras. We especially enjoyed the “Los Pollitos Dicen” coloring page! As they colored we sang the song! ¡Hola Carmen! You're welcome! Thank you so much, and I hope I can continue to inspire you with more great ideas and activities!